A DOGGED Drogheda United dragged Derry City back into the relegation scrap following their first league victory since last June 26th! 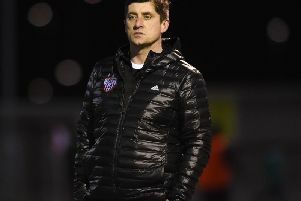 It was former Republic of Ireland international, Mark Kinsella’s first game in charge as caretaker boss and he will be delighted to see his side move one point clear of Peter Hutton’s troops. A Sean Thornton header two minutes before half-time and Jason Marks’ close range strike on 77 minutes was enough for the win but Derry will rue a plethora of missed chance in the first half. Patrick McEleney was the main threat in the early stages for City and he registered the home side’s first shot on target on five minutes. The striker played a short corner with Stephen Dooley before cutting inside on the edge of the penalty area and his left foot strike was easily gathered by Michael Schlingermann. Drogheda responded four minutes later when Keith Treacy chased down his own header from midfield and won the race against Dean Jarvis but his strike hit the side netting. McEleney did superbly to gain an extra yard with a feint on the edge of the box before letting fly with his right foot and his shot went narrowly wide of the far post with the keeper beaten. Aaron McEneff also tried his luck from distance but he never really had his effort under control and it went harmlessly wide. Derry almost capitalised from a quick break from the back as Dooley played McEleney in behind the Drogheda defence but his first time strike went straight into the hands of the keeper. McEleney’s inswinging corner kick on the half hour mark then almost caught out the Drogheda keeper but he managed to retreat quick enough to tip the ball over the bar. Derry should have taken the lead on 34 minutes when Dooley played Ciaran O’Connor into space inside the penalty area. The striker dragged the ball back onto his left foot but then sent his shot well over the crossbar. Schlingermann was called into action again on 38 minutes when McEneff’s inviting cross from the left was headed towards goal by O’Connor but it was saved at point blank range by the Drogheda keeper. For all City’s dominance it was Drogheda who broke the deadlock two minutes before the break as Thornton powerfully headed home from Adam Whelan’s cross. Five minutes after the restart Dooley felt Derry should have been awarded a penalty when his header from Timlin’s cross appeared to strike the hand of Joe Gorman but the referee waved play on. Gorman was in the thick of the action three minutes later when he cleared Dooley’s first time shot off the line as City continued to press forward. And the Drogheda left-back could have put his side further ahead at the other end on 57 minutes when he burst through the Derry defence but he dragged his shot across goal and wide. Drogheda continued to frustrate their hosts forcing Peter Hutton to revert to a 4-4-2 formation following the introduction of new signing Ben McLaughlin at the expense of McEneff. Derry’s top scorer, Mark Timlin then joined O’Connor in a two pronged attack as the Candystripes went in search of an equaliser with just over 20 minutes remaining. Barry McNamee rippled the side netting of the Drogheda goal from a free-kick on 73 minutes. However, Drogheda doubled their lead on 77 minutes when Marks was left with the simple task of firing into the unguarded net when Whelan’s cross found him free at the back post. Derry once again were claiming for a penalty kick with five minutes to go when Dooley went down inside the are under the challenge of the Drogheda keeper but the referee signalled for a corner kick. For all their efforts, however, City couldn’t break down a resolute Drogheda defence as Kinsella’s men moved one point clear of the Candystripes. Derry City: G. Doherty: R. McCornwall, A. Barry, D. Jarvis; S. Dooley, B. McNamee, A. McEneff ( B. McLaughlin 68), C. McCormack, M. Timlin; P. McEleney, C. O’Connor (M. Quigley 75); Subs Not Used - S. Patton, S. Sharkey, J. Daniels, R. Curtis, R. Curran. Drogheda Utd: M. Schlingermann; L. Buckley, A. Byrne, R. O’Reilly, J. Gorman; A. Whelan ( R. Bayly 81), M. Daly, S. Thornton, K. Treacy (S. Brennan 56), J. Marks; G. Pender (T. Mulvenna 66); Subs Not Used - E. Farrell, M. Hughes, L. Duffy, R. McKenna.